A split-seconds chronograph, or a “Chronographe à rattrapante,” makes it possible to take intermediate chronograph readings while continuing to time a longer event. In a watch with the conventional arrangement of pushers, you start the chronograph by pressing the pusher at 2 o’clock, and the two chronograph seconds hands start moving around the dial, perfectly superposed. When you press the split-second pusher, one of the chronograph hands stops, so that you can read the time elapsed up until that moment, while the other hand continues running. With another press of the same pusher, the stopped hand flicks forward to join the other hand and they continue their journey together. You can repeat the process as many times as you like but in practice it is useful above all for the first intermediate reading and for an intermediate time of less than 60 seconds. It’s a surprisingly lonely category, partly because one of the brands that previously had several split-seconds chronographs in their catalogue – Blancpain – has decided to withdraw from this area of complications. The watches are in increasing price order. This attractive piece has a period look provided by the cream dial and black hands and markings, reminiscent of 1960s car dashboard instruments. It also looks very technical, with two tachymeter scales in addition to a seconds scale with quarter-second subdivisions, and three pushers on the caseband. The watch’s principal function sounds impressive in the German name on the dial, “Schleppzeiger chronograph:” this simply indicates the split-seconds function. The movement is based on the ubiquitous Valjoux 7750 calibre, extensively modified to add column wheel control and the split seconds function. This work was performed by external supplier La Joux Perret, and in addition to adding the extra function, the column wheel control makes the pushers smoother in operation. The case is in stainless steel, with 10 bar water resistance rating (100 metres) 41.5 mm in diameter, fairly thick at 15.5 mm. The display caseback reveals the self-winding movement which is nicely decorated with blued screws, blue column wheel, and an oscillating weight with the Sinn logo and Côtes de Genève stripes. 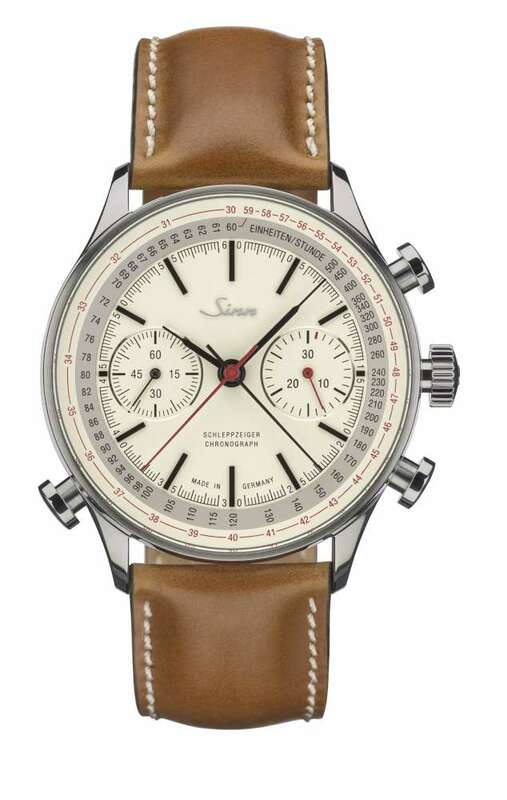 The Sinn 910 Jubilaeum, a limited edition of 300 watches, costs €5,500. Read more here. Locman’s Montecristo Rattrapante is their most sophisticated watch produced to date, a limited edition of 100 pieces. 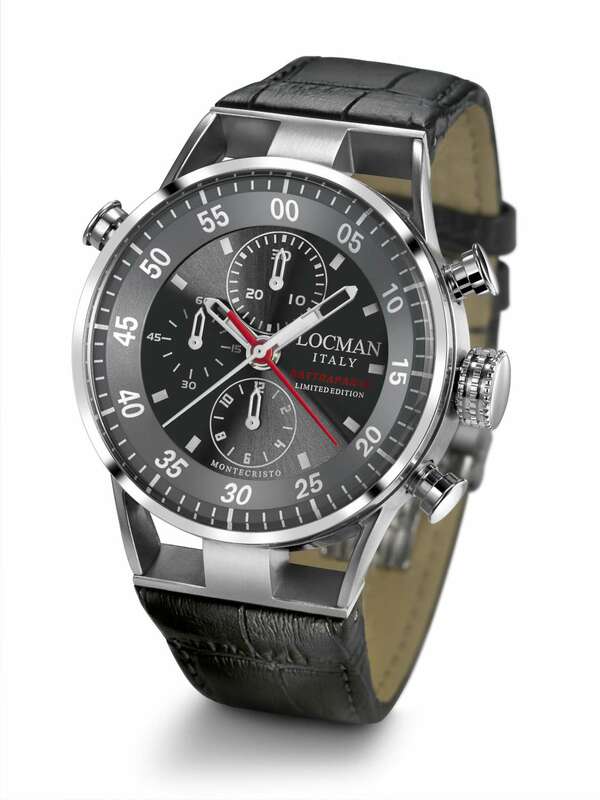 Locman have used an ETA 7750 movement, one of the most widely-used chronograph movements, that the brand has extensively modified to add the rattrapante feature. The case is in 316L steel and brushed titanium, with a caseback having a crystal display window revealing the movement. The skeletonized gold-finish oscillating weight is branded with the company name. The leather strap is fixed to the brand’s characteristic openworked, three-strut lugs, and in the presentation case, there is an extra strap in silicone. The price of the watch is €5,850. Read more here. 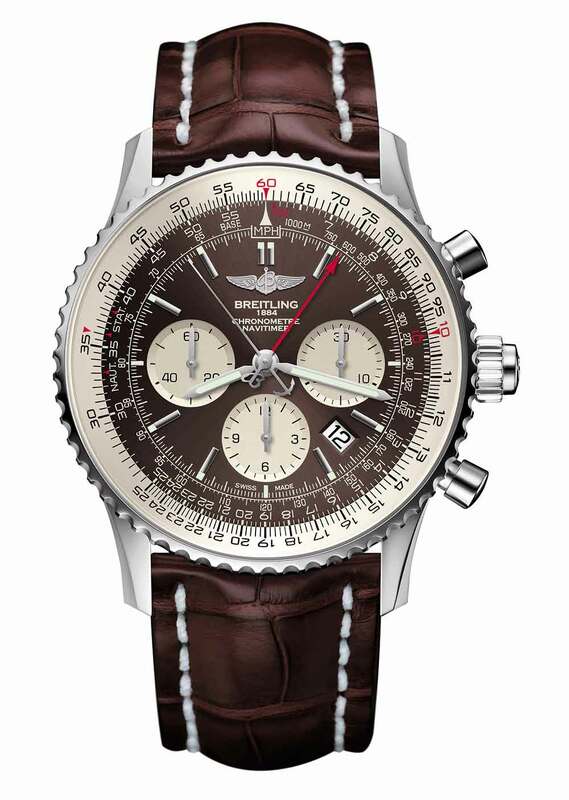 Breitling’s Navitimer Rattrapante has a new in-house split-seconds chronograph movement that incorporates two patents. It is COSC chronometer-certified, and it operates using the most prestigious chronograph layout, column wheel and vertical clutch. The dial is the classic Navitimer, with bidirectional rotating bezel providing a circular slide rule for calculations, conversions, percentages and so forth. Breitling designed the B03 movement entirely in-house. It is based on the Breitling Calibre 01, with a modular architecture that facilitates maintenance, because the split-second module can be easily lifted out from between the mainplate and the calendar mechanism. The split-second pusher is in the crown. The B03 movement is self-winding and runs at 28,800 vibrations per hour, 4 Hertz, power reserve 70 hours. The case is 45 mm in diameter, with a range of straps available, leather, crocodile, rubber, and a metal bracelet. The red gold version has a transparent caseback. The Breitling Navitimer Rattrapante costs from €9,900 in the steel version with leather strap, and from €28,400 in the red gold version. Read more here. 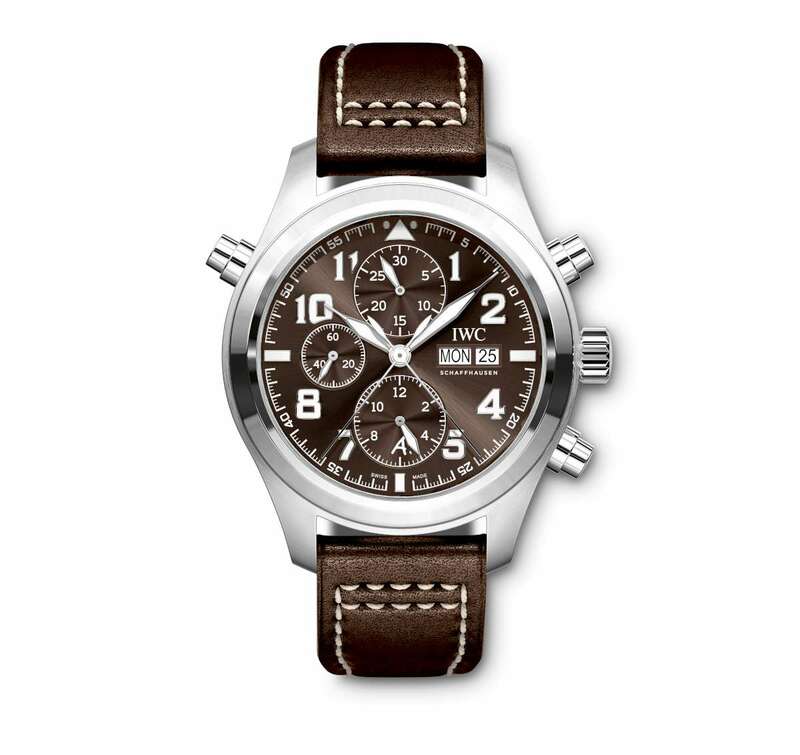 This pilot’s watch by IWC is distinctive for its tobacco brown dial and calfskin strap with cream-coloured contrasting stitching, one of the brand’s hallmarks for its watches made in cooperation with charity organization Fondation Antoine de Saint-Exupéry. The dial is very busy, with three subdials, day and date windows, and seven hands. The watch is powered by the self-winding 79420-calibre chronograph movement. This is based on an ETA movement, the Valjoux 7750, but with extensive modification, adding the rattrapante mechanism. It runs at 28,800 vibrations per hour (4 Hertz) and has a power reserve of 44 hours. The stainless steel case is 44 mm in diameter, 17 mm thick, hand-finished with differentiated polished and satin surfaces. Water resistance 6 bar, 60 metres water. It has a soft iron inner case for protection against magnetic fields. Price €12,400 incl. tax, £8,750 incl. VAT. It is a special limited edition of 1,000 watches, available from April 2016. Read more here. The U30 by Angelus combines three complications, tourbillon, flyback chronogtraph, and split-seconds display, with two column wheels, automatic winding, and power reserve display. There is no dial, just the skeletonized bridges, grey NAC-treated or black ADLC-treated to provide maximum contrast with the wheels. A total of 15 wheels can be seen from the dial side, within a bridge architecture based on straight lines and loosely resembling an A-shape placed on its side. 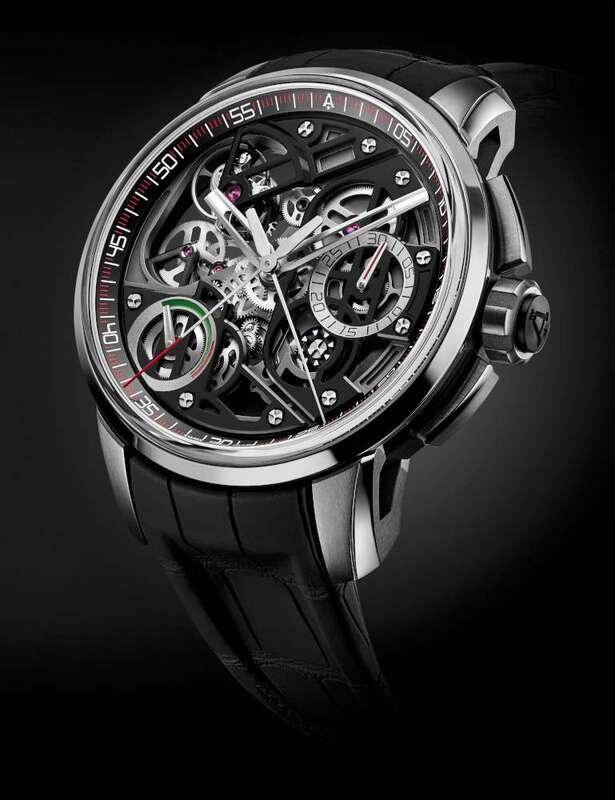 At top left, the one-minute tourbillon runs at 28,800 vibrations per hour (4 Hertz). Underneath, the power reserve indicator (45 days) is at 8 o’clock, with green and red enamel showing respectively optimum power and winding required. At four o’clock, the column wheel controlling the split seconds function is in view, just below the chronograph minutes counter at 3 o’clock. The designers deliberately chose to concentrate on displaying as much of the movement as possible, and so the functional aspects of the watch’s display have been put in second place. The U30 is a large watch, with a 47 mm titanium case, 15 mm thick, 30 metres water resistance. The Angelus U30 Tourbillon Rattrapante is a limited edition of 25 pieces, price 55,000 Swiss francs. Read more here. The Tonda Chronor Anniversaire by Parmigiani Fleurier is a very technical piece, with a clear and functional dial. Its utility is further enhanced by the big date. It is also exceptional in that the movement is entirely made in rose gold. 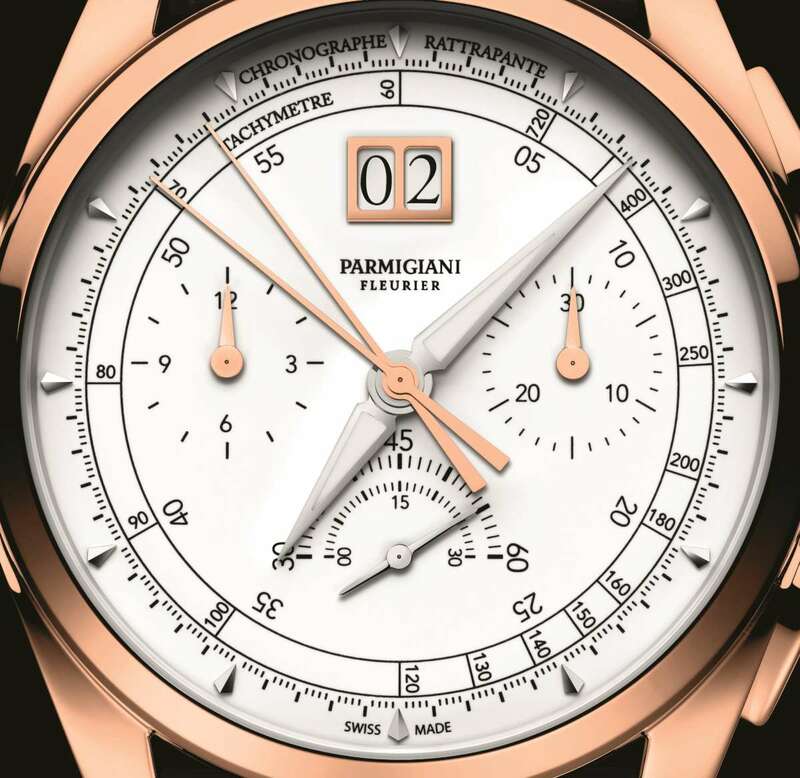 The PF361 movement is the first integrated chronograph by Parmigiani Fleurier, running at 36,000 vibrations per hour, 5 Hertz, the most logical frequency for a chronograph because it enables tenths of seconds to be measured and displayed on a chapter ring marked in fifths of seconds. The chronograph is controlled by a column wheel, with vertical clutch. The single handwound mainspring barrel provides a power reserve of 65 hours. The view through the transparent display caseback is beautiful. The bridges are designed in the form of concentric circles radiating out from the balance, like circular waves rippling out from where a stone is thrown into water. The two crown wheels are in prominent view, and Michel Parmigiani’s signature can be seen on the mainspring barrel at the top. The case is 42.1 mm in diameter and 14.6 mm chick, with water resistance 3 bar (30 metres). 25 pieces of each case type (white or rose gold) will be made. Price 135,000 Swiss francs. Read more here. This split second chronograph, reference 5370 by Patek Philippe, is part of the brand’s tradition, because their first chronograph wristwatch presented in 1923 was a split-second model, and this complication has always been part of its range in various models. However it is surprising that Patek Philippe’s first chronograph with an in-house movement was introduced only in 2009, and the first in-house split-second chronograph appeared in 2012 in combination with a perpetual calendar. 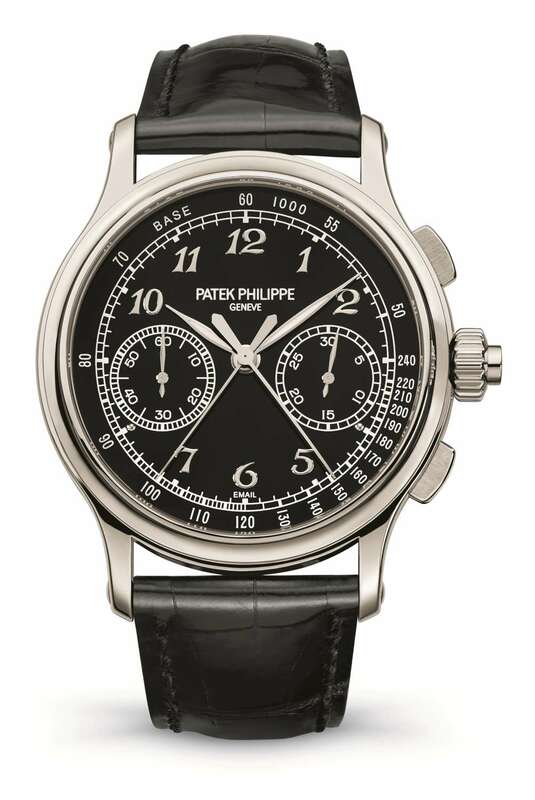 So this piece, reference 5370, is Patek’s first standalone split-second chronograph with in-house movement. The CHR 29-535 PS calibre has 312 parts and it is entirely classical, with two column wheels and a horizontal clutch. It comprises seven patented innovations, amongst which a system that ensures exact alignment between the chronograph and split-seconds hands when they are moving together. The platinum case is 41 mm in diameter, 13.56 mm thick, and has a water resistance of 3 bar, 30 metres. The watch has a hand-stitched alligator strap with a deployant buckle in platinum. The spectacular movement is visible through the sapphire caseback. Price 220,000 Swiss francs. Read more here. The ExoTourbillon is at the top of the dial, with a slow tourbillon rotation, once every four minutes. The dial arrangement is balanced and symmetrical, and it is only on a second glance that you begin to realize that it’s not the normal arrangement. Three hands are pivoted at the centre, the skeletonized minute hand, and the two chronograph hands, one blued, the other pale gold. The continuously-running seconds dial is at 9 o’clock, and the chronograph minutes dial is at three o’clock. On the subdial at 6 o’clock, there is the hour hand, skeletonized in blue, and another black hour hand, showing the time in a second time zone (adjusting the time zone is performed using the pusher at 8 o’clock). Lastly, on a very small subdial at 4 o’clock, the hours are shown on a 24-hour dial. The dial is very three-dimensional, with a flange marked with fifth-of-a-second graduations for the chronograph function. 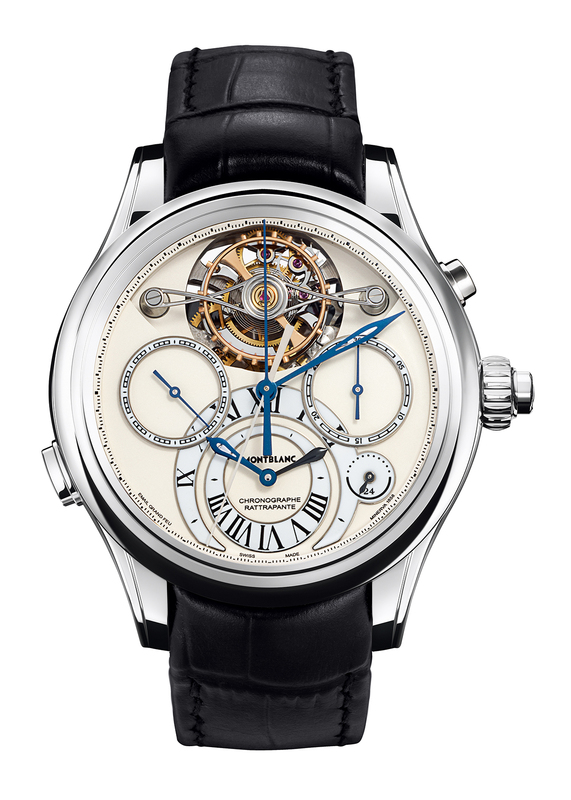 This is a limited edition of 18 watches, part of the Villeret 1858 collection. The gold case is large at 47 mm, and it has a sapphire caseback revealing parts of the movement: the chronograph column wheel at 6 o’clock, the split-second column wheel near the split-second button, and between the two, the various levers used for the chronograph mechanism. The balance has a frequency of 18,000 oscillations per hour, 2.5 per second, which enables elapsed intervals to be measured to the nearest fifth of a second. Price is €250,000. Read more here. The Harmony Ultra-Thin Grand Complication Chronograph is powered by the new Calibre 3500, the thinnest of its type (monopusher split-second chronograph) in the world, just 5.2 mm thick with 459 components. The watch is truly beautiful on both dial side and reverse, a monopusher design with a peripheral rotor powering the self-winding movement, mounted on ball bearings and providing a good view of the calibre. One of the new features of this piece is a system that blocks movement of the oscillating weight when the spring is already fully wound, reducing unnecessary friction and increasing the time before maintenance is necessary. This system also prevents the mainspring from reaching an excessive tension: in practical terms, just the best, central parts of the watch’s power reserve are used to ensure optimum precision. The watch has a power reserve of over 50 hours. The dial has a small seconds subdial at 9 o’clock, a 60-minute counter at 3 o’clock, a power reserve indicator, and a deep red tachymeter scale. The blue Arabic numerals coordinate with the blued chronograph hands, with leaf-type hands for hours and minutes. The ultra-thin case is in platinum, 8.4 mm thick, and size 42 x 52 mm, with a blue alligator leather strap. Just 10 pieces of this watch were made for the 260th anniversary year. 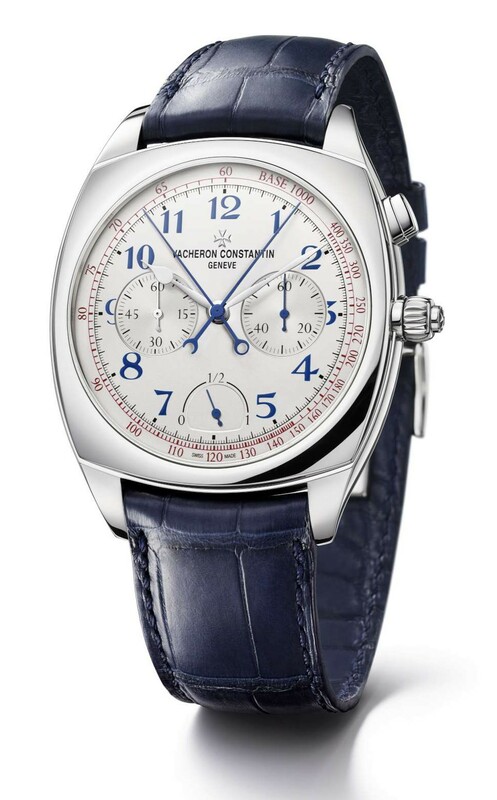 The watch is available only in Vacheron Constantin boutiques. It is delivered with a magnifying glass in the anniversary presentation box. Price $369,200. Read more here. 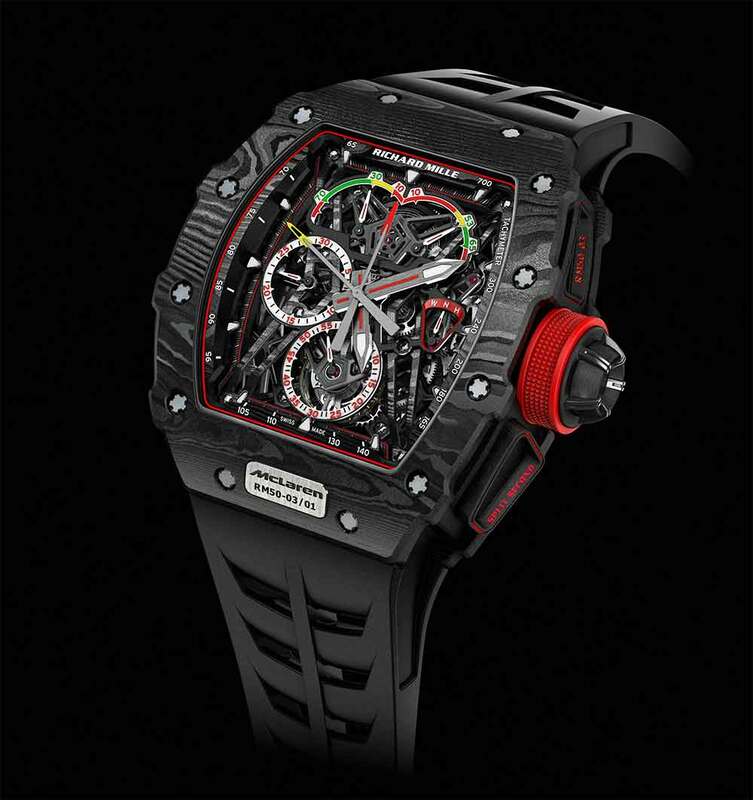 This watch was presented by Richard Mille in early 2017, and it reflects the partnership that he signed with McLaren in 2016, a ten-year agreement. The watch incorporates high-tech materials such as titanium and Carbon TPT, along with a world first in the world of watchmaking, Graph TPT or graphene, which enhances the physical properties of the Carbon TPT used for the case, baseplate, bridges and the rubber of the strap The result is a watch with a movement weighing just 7 grams, while the complete watch weighs 40 grams. It is the lightest split-seconds chronograph in the world. The hand-wound RM50-03 movement with about 600 parts has a tourbillon escapement, with indicators on the dial for the 70-hour power reserve, and a torque sensor. The watch is just over 44 mm wide and almost 50 mm from top to bottom. Its thickness is just over 16 mm. The crown has a function indicator, so that the three positions are displayed, Winding, Neutral, Hand Setting. In Richard Mille’s classic style, this is a watch in which the superb engineering is combined with a tonneau-shaped watch case that also determines the layout of the seconds scale, and so getting precise chronograph readings is impossible. The RM 50-03 McLaren F1 is a limited edition of 75 pieces, price 980,000 Swiss francs + tax, approximately €1,112,000 including VAT. Read more here. The Chronographe Monopoussoir Rattrapante Bleu, an entirely new watch developed by F.P. 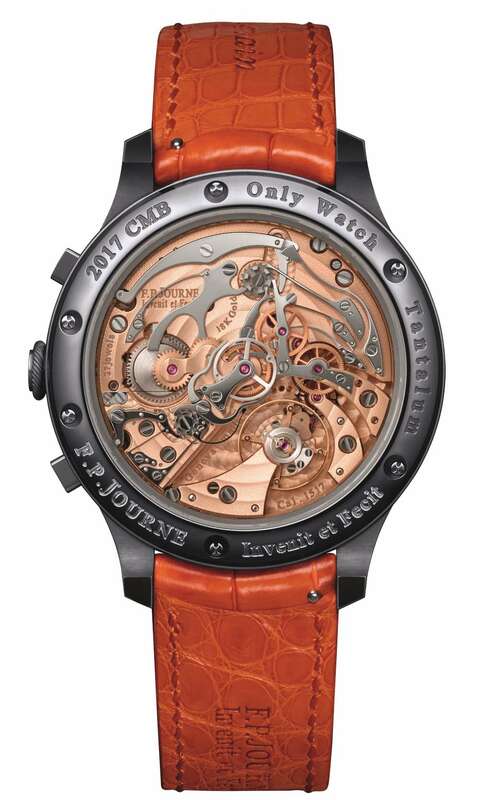 Journe specially for the Only Watch charity auction, achieved the incredible price of 1,150,000 Swiss francs. 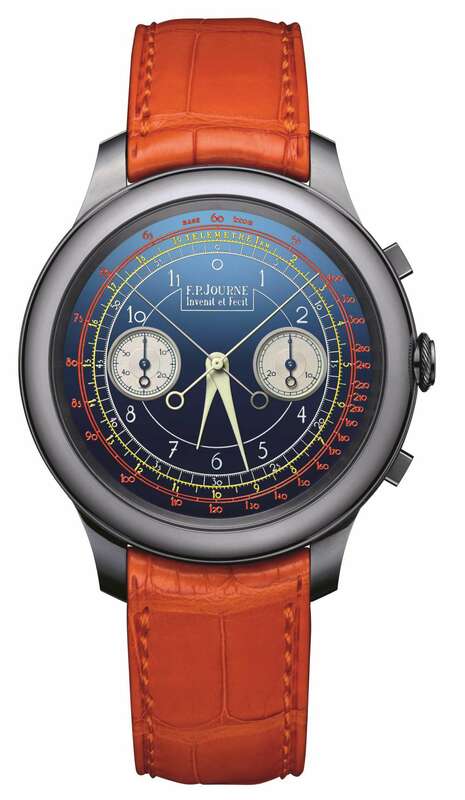 It is a beautiful watch, with a blue dial, a tantalum case and an orange strap. At the moment it is a one-off piece, and the brand are not saying whether this will be followed by a series of watches. In any case they would be fairly exclusive pieces as is true for all F.P. Journe timepieces. The Christies estimate of 200,000-400,000 for this watch give an idea of what a subsequent production watch could cost. The tantalum case is 44 mm in diameter and 11.5 mm thick. Even though it has the usual two chronograph pushers, F.P. Journe describes it as a monopusher because the top pusher is for start, stop and reset, while the bottom pusher is for the split seconds function. The dial is attractive and colourful, with an orange tachymetric scale at the outer edge, then a yellow telemetric scale, and a seconds scale with fifth-second subdivisions. The movement is in gold with some steel levers to provide contrast, and it offers 80 hours power reserve, even when the chronograph is running. Read more on the F.P. Journe website.